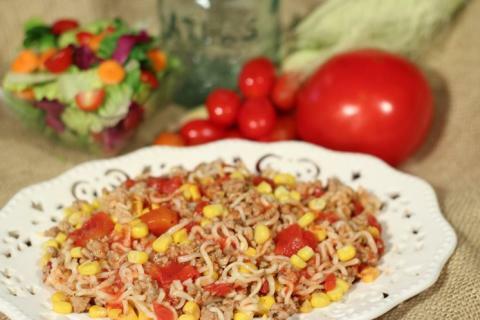 A healthy twist on Ramen noodles! In a large skillet, brown ground turkey. Drain off grease into an empty container. Wipe lids of cans of diced tomatoes and corn with a damp paper towel. Add can of tomatoes with juice to skillet. Pour away liquid from canned corn. Add canned corn to skillet. Add Italian seasoning and pepper to skillet. Crumble package of Ramen noodles. Add Ramen noodles to skillet, throwing away seasoning packet. Cover and simmer about 10 minutes or until noodles are tender and the liquid is absorbed. Crumble ground turkey into microwave-safe, 2-quart casserole dish. Microwave on high power for 2 minutes and stir. Microwave another 2 minutes and stir again. Continue microwaving and stirring until all meat is browned, no pink remains, juices are clear, and there is no evidence of blood (about 3-4 minutes). Drain corn and add to ground turkey. Add tomatoes with liquid, Italian seasoning, and pepper. Stir to mix. Crumble unopened package of Ramen noodles. Open Ramen noodles and remove seasoning packet. Microwave 2 more minutes and stir again. Continue microwaving and stirring until noodles are tender and liquid is absorbed (about 6-8 minutes).